Carter Subaru Ballard's knowledgeable factory trained technicians ensue quality workmanship using only genuine Subaru parts. No independent garage or repair shop can make that claim! Also, when comparing Carter Subaru to independent repair garages, it's important to keep in mind that Carter honors the original Subaru factory warranty and extended warranty, and has current up-to-date information on service bulletins and possible recalls. In addition, our services are quoted all-inclusive, so you won't be annoyed with add-on's you did not expect. Our 2 locations in Shoreline and Ballard are convenient to Seattle, Mercer Island, Lynnwood, Everett, Edmonds and Bothell. On the Eastside we're convenient if you live in Bellevue, Renton, Kirkland, Redmond or Issaquah. Carter Subaru Ballard repair, service and maintenance coupons and specials are Subaru's best service offers and coupons in Seattle, Washington. Our Subaru automotive service and repair deals in Seattle Washington are designed to save you, our valued customer, money and to make servicing your Subaru much easier! Carter Subaru Ballard offers the very best service and maintenance in Seattle, along with the lowest prices. Unlike many other independent repair shops, our technicians have the latest, most up to date factory training and certification. Keep your Subaru factory fresh and in top running condition at your trusted Seattle Dealer, Carter Subaru Ballard. Here at Carter Subaru Ballard, we've offered Seattle, WA a hassle-free car experience since 1960 and our vehicle service is one of the ways we make your experience hassle-free. When you choose our state-of-the-art service center for the maintenance your Subaru needs, you'll have cutting-edge Subaru service performed by factory trained technicians. While that would be plenty, we want to help you save on your Subaru maintenance with our service specials. 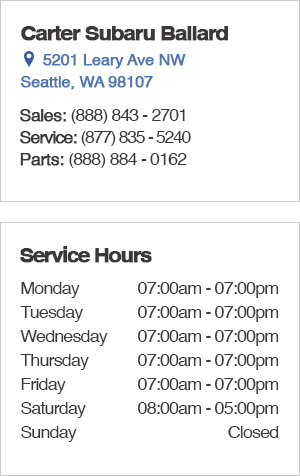 We also offer great deals on Subaru parts and accessories when you're looking to maintain your vehicle yourself. And, if you're ready for something new, choose a vehicle from our new Subaru selection or certified pre-owned vehicles. Experience hassle-free today at Carter Subaru Ballard at 5201 Leary Ave. NW, Seattle, WA 98107, a short drive from Bellevue and Bainbridge Island, WA, or call us ahead of time at (877) 835-5240 to schedule your service appointment!